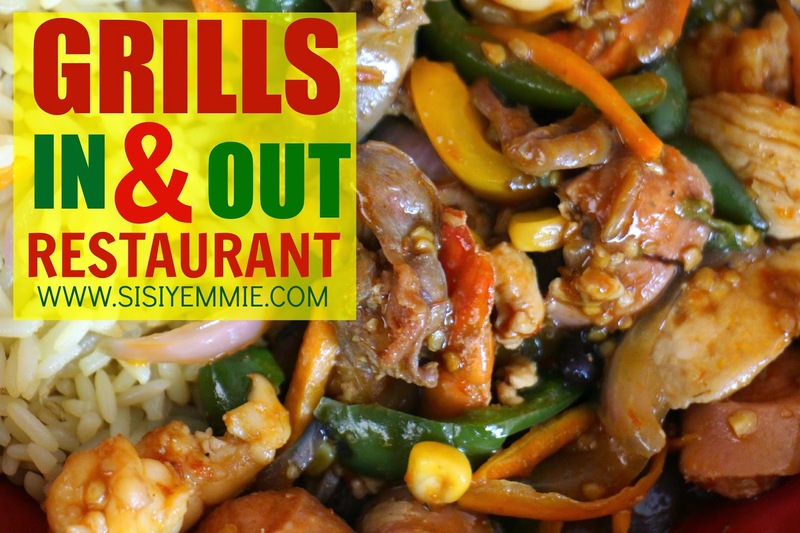 GRILLS IN & OUT RESTAURANT LAGOS - REVIEW + GIVEAWAY! I am so so so excited about today's review only because I found something special. Some of you are familiar with Grills In & Out: well, those of you in Abuja. Let me know if you've been there and what your experience was like (I've heard mostly good things about this place). Ok so I was just minding my business when Nkechi (a lovely blog reader, thanks girl!) tagged me in a photo on Instagram with the caption that she was waiting for my review before visiting this new spot. I was curious…the convo underneath the picture was intriguing…I mean , people were talking about one Mongolian menu…what is that??? And some said “finally”…finally what? E ja mi si. Grills In and Out opened on Wednesday in Lekki and I was there, live and direct. The problem with doing food reviews is company. I will not carry myself alone to go and eat, which is why I need to recruit more friends, after all, friends that eat together, stay together. Abi? Anyways I’m glad Bobo was game so I dragged him and off we went to Grills In & Out! The hospitality was very warm, we were met at the door by Franklin and he waited on us all through. He even took time out to show us around the restaurant, giving very detailed explanation. In fact, he get’s extra points for suggesting to take a photo of Bobo and I: such a friendly guy. I hope this is not a one off sha, considering it was their first day opening the restaurant…time will tell. I loved the ambiance, it was earthy: oranges and browns…orange makes me happy/hungry, brown keeps the balance. When you walk into the restaurant, to your right is the service station where you order your meals and choose your Mongolian menu (I go explain this Mongolian). You can’t skip toilets in a review, they had a nice toilet so I guess I was one of the first people to launch it? lol …it was lacking a hand dryer and I’d suggest they add one and a hand sanitizer station. The have an outdoor area which is very colourful with swinging chairs that are so relaxing… I tried it out. You and your “bae” can just go there and be swinging away. They also had a room upstairs that can cater for small events, maybe 20 people, so a good spot for a private dinner party, bridal shower ...that kain thing. Also upstairs, Franklin showed us another dining area where you can make your food yourself ….on your table! Just look at that, grill your food yourself, he assured us that it was non smoky and I can’t wait till they start using that part of the restaurant; I’d love to see how that plays out. Wondafu. I came for the Boli and Fish but Franklin suggested we try that Mongolian …lets try it! So this Mongolian idea is that you go to the service station and based on the menu you choose, you can pick vegetables, fish, prawns, beef, chicken along with a selection of rice for your meal. The mixture is prepared on the spot and according to your requirements. This Mongolian was my favourite and I’m going back there today… na so the tin dey do me. We also had grilled fish with ata din din and roasted plantain. Oh my…it was so spicy and yummy. Bobo’s nose was runny and his eyes were teary but he was still eating it oh, he did not stop. LOL. I loved the fish more, I wish the plantain was a bit more firm and unripe… soft boli is not my thing. Ehen, for drinks we both ordered a fun cup Chapman, I thought it was just going to be like any other Chapman I've been served in this Lagos, but it was different. It was frozen, and it was in this nice fancy cup that looked like a trophy…and what’s more? I could take the cup home! Oh, and I can bring it back if I want a refill…LOL. In fact, Franklin said if I bring it back I get the Chapman for half price… hip hip hip! Hurray! I was later informed that Grills In and Out has a sister company called Cocktails In and Out and they’re responsible for the drinks… Impressive. Abuja people you've been enjoying oh. The damage done to our pocket was about N11,000, that's because we ordered two funcup chapman at N1500/N1600 each. I Mongolian Menu at N3000 , Fish and Boli approximately N2500 and a starter of seafood which was about N2500 too. I think the pricing is fair, especially for the Chapman. The only thing I didn't like was that after eating Bobo had to drive to an atm to get money because they have not started using their POS. I know they just opened that day, but the pbasics should have been ready like easy payment options. Not everybody carries 11K in their pockets... hopefully this will be fixed by the time you go there. Well considering that for 5k I can order that Mongolian menu and a Chapman (which I loved) I’d like to send one of you off to Grills In and Out to try the same thing I had…or anything else you like as long as you no pass that 5k…unless you add money on top. You like? All you need to do to win this is leave a comment + email address showing interest. Have you been to any nice restaurant/lounge/place lately? Tell me about it! would love to go there and try out the mongolian meal option. Heard about Grills in and out in Abj but I have never been there!! Would love to try eet! They are located at Foodcity #1 Kindia Close, Off Bangui close, Adetokunbo Ademola crescent, Wuse 2. Foodcity is the building where Yogurberry is in. My ever first comment on a blog. I love what you had, would like to go with my Bobo too. Bcadedoja@gmail.com. Mehhnn, Sisi Yemmie, you no waste time atall o! I can't wait to go, I went to the one in Abuja last year and I LOVED it. I mentioned it on my blog sef in my Abuja Chronicles II post. I had crabs and wings and then I was too full to try the Mongolian, snails or gizzard. Can't wait to visit the one in Lagos and review it. I left my funcup with my friend in Abuja sha but their virgin strawberry daiquiri is really delicious too. oh woow, i cant wait to go to naija and try it. Hopefully i will next yr.
Woot woot! Fun spot to try out soon. Sisi yemmie I won't mind the give away o. Taste bud has been whacky cos of morning sickness, now that am out of morning sickness zone don't mind trying out some thing new. im a food lover. the food looks so yummy. i cant wait. Hi Sisi, please I sent you an email and a message on FB. I would really appreciate if I get a response from you. Thanks.